Our conversation with Dr. Janusz Kozinski, Founding Dean of the Lassonde School of Engineering, covers the trials and tribulations of starting a new engineering school, as well as the the attributes and mindset of a “renaissance engineer.” Additionally, we learn a little bit about the skill sets that will be expected of tomorrow’s engineering professional. Carmen tries to stay well-informed about topics outside of his field of engineering. Our guest for this episode is Janusz Kozinski, Founding Dean of the Lassonde School of Engineering at York University in Toronto, Canada. Janusz had an early interest in biomedical engineering, leading him to study the effect of environmental pollutants on human health. Our guest describes the “accidental” nature of many important discoveries, mentioning a book that describes how DNA structure was revealed by James Watson and Francis Crick. Janusz like to see a “messy” lab, as he believes it reflects the chaotic nature of serious research. On the other hand, Carmen finds that he is more effective when he keeps his lab bench neat and tidy. Smoke from a bad cigar (pdf) led to the discovery of electron spin by Stern and Gerlach, as Carmen notes. The engineering program at the Lassonde School of Engineering attempts to integrate curriculum from the business and law schools with traditional engineering subjects. While the Lassonde School is relatively new, it is located on the campus of York University, the 3rd largest university in Canada. Initiated in 2012, and named for philanthropist Pierre Lassonde, the Lassonde School is the first new engineering school to be established in Canada over the past 40 years. A “flipped classroom” allows course content to be delivered via videos or screencasts outside the classroom, while class periods are used for solving problems and completing homework assignments under the guidance of an instructor. Recognizing the importance of industrial experience, the Lassonde School is in the process of implementing a co-op program. Jeff references a prior episode of this podcast, titled Empathy, in which it was noted that engineering students tend to be less empathetic than students in other programs of study. Janusz explains the importance of matching an organization’s tasks and duties with its human talent. A biological engineering initiative at Lassonde was put on the shelf because the school didn’t feel that it had the proper faculty to implement the program. Learning more about oneself is the starting point for becoming a “renaissance engineer,” according to our guest. Dean Kozinski notes that some of his school’s wealthiest alumni were C+ students who did not achieve top grades (although this is not a point he makes with his current students). Lassonde is funding a movie about the “Renaissance of Engineering,” to be released in mid-October of 2014. Our guest can be reached via the Lassonde School of Engineering website. 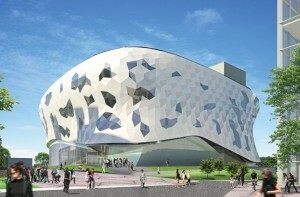 Thanks to the Lassonde School of Engineering for the image of their new engineering building. Podcast theme music by Paul Stevenson.